After just having been to Iran with my friend Gerlinde, I remembered that I never informed you about the English translation I didÂ for theÂ book she wrote together with Karin SteinbachÂ called “Mountains in my heart”. I spent the best part of 2013 working on the book and I actually translated parts of it in my tent at Camp 2 on Nuptse, when I was climbing it in spring that year. It was the first book I have ever translated and even though it was a huge challenge, it really helped knowing Gerlinde and the world, she loves so much. Doing part of the work in the mountains gave me the right surroundings and atmosphere to get her emotions across and I really hope I did her words justice. Effusive, charismatic, tough, Gerlinde Kaltenbrunner is one of the world’s most successful high-altitude mountaineers and the first woman to climb all fourteen 8,000-meter peaks without supplemental oxygen–and she also eschews high-altitude porters. 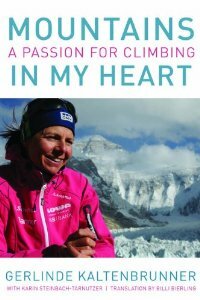 Mountains in My Heart covers her early years learning to climb in Austria, her personal life, her training as an oncology nurse, and her ever-present passion for mountains, especially the Himalaya. Her love of being in the mountains shines through in her writing: For Gerlinde the important thing was not the race to be the first woman to climb the 8,000-meter peaks, but rather to experience the mountains and climb them in her self-sufficient style. Self-sufficiency did not, however, mean climbing without her husband, Ralf Dujmovits; in 2009, Lhotse became her twelfth and his fourteenth 8,000-meter peak! Kaltenbrunner shares the challenges, dangers, and euphoria of her high-altitude climbs, detailing medical emergencies and her own feelings about being high in the mountains. Her writing is honest, captivating, and unrestrained. Billi, you are a Great, Great woman.. Thank you so much for such a nice translation! Your translation is excellent, very fluent and into the book I felt a high mountaineer did this translation, not just a normal translator. Congratulation for your big job and giving us this opportunity to read gorgeous lady of Himalaya’s diary. A bad translation can kill soul of book which is happened for some mountaineering books already but you did great and I recommend every body to read this fantastic book.